Is it me or is everyone hosting a baby shower this spring?? We were inspired by the cloud-shaped plates from our new Oh Happy Day! paper party line to come up with a few fresh spring-y baby shower elements for an April shower. Read on for our ideas and a free matching printable tag! We wanted to keep things soft with pastels and air-y white tones, and a touch of natural birchwood. Don’t forget to add a bit of silver to accent the cloud’s silver-lining! 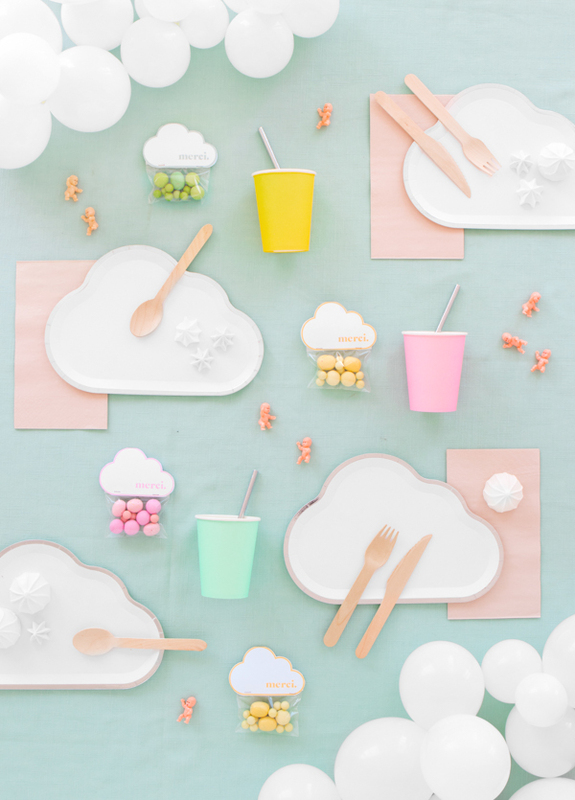 These cloud shaped favor bags are a fun way for guests to take the party home with them. Bonus — they match the plates so they can double for place settings, too! For the tablescape, we made a balloon cloud centerpiece. It’s a simple way to add a bit of height and texture to a tablesetting — and its so easy to make! Step 1: Print the cloud template onto white cardstock. Step 2: Cut out the shapes and fold along the mirrored line. Step 3: Fill the cellophane bag half way with matching colored candies. Fold the top and tape. Step 4: Layer the cloud tag on top and staple along the bottom hem! Step 1: Start by inflating the balloons in different sizes, making the 11” balloons only 7” and smaller. Step 2: Tie three balloons together in a cloud cluster with a simple knot. Step 3: Place the ‘clouds’ along the center of the table in different heights. 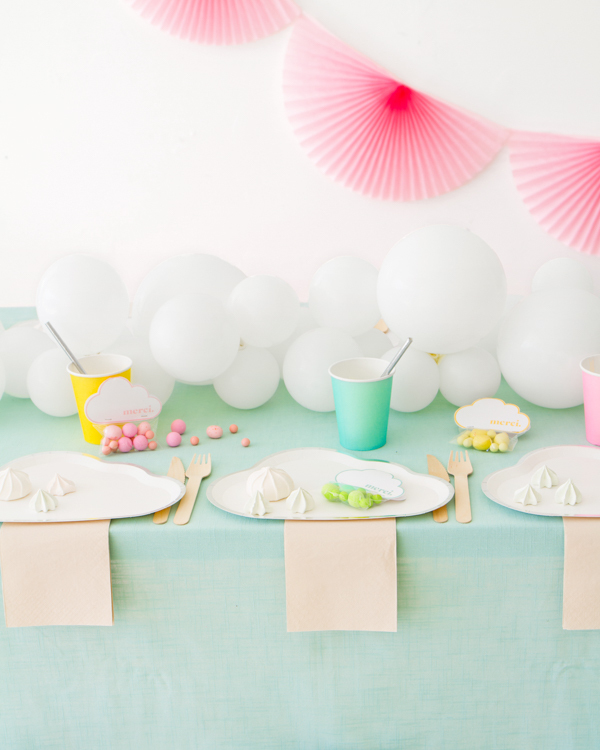 Make a small loop out of the tape and attach the balloons at the table with the tape to keep them from moving around. So easy! Lovely! Pastels are always a winner for me, even though I don’t have a single baby shower on the horizon! I love those plates! They are the cutest! 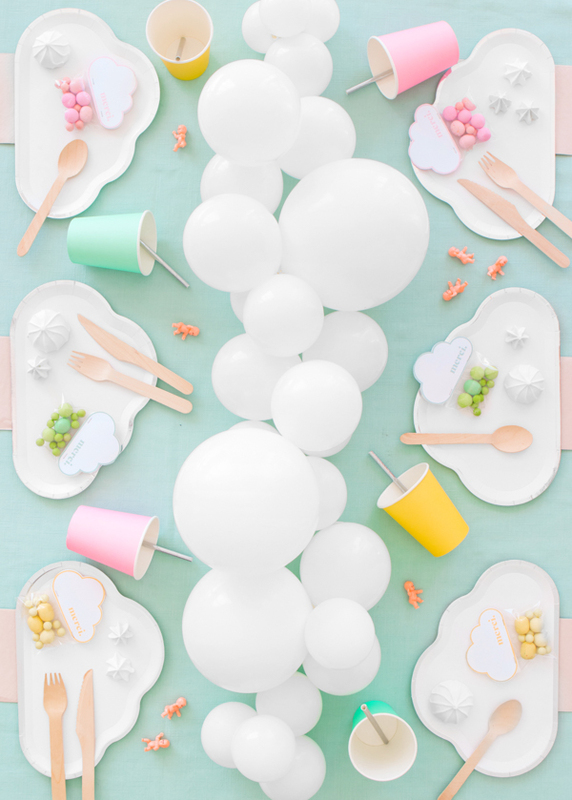 Baby Shower idea is a great idea if you are looking for planning a birthday party for a 2-3 year old child. I think baby loves to spend more time in showers.